Welcome to Cozy Corner where you can feel totally at home away from home! Located south of the settlement, midway between Hope Town and White Sound marina, Cozy Corner is just a few minutes walk from the Atlantic ocean or the Sea of Abaco. * Please note that the location on the map is not accurate. This new house is surrounded by a lush, tropically landscaped yard, large deck and your own POOL! A master bedroom with king bed shares a bathroom with a guest room outfitted with queen bed. The upstairs loft-style bedroom has 2 double beds, walk-in closet and spacious bathroom. These accommodations lodge up to 8 and are perfect for 1 or 2 families and up to 3 couples. Prepare meals in the gourmet kitchen or grill outdoors using the large gas grill. Dine inside or alfresco. Relax on the sofa with reclining seat or lounge at the pool. Listen to your ipod via the Bose docking station or your own cd's played on the surround sound system. Watch cable or DVD's on the 42' flat screen TV. Surf the internet with wifi access. Rent a golf cart or bike and explore the variety of beaches and varied dining options. Observe the last kerosene-fueled lighthouse in the world while sipping coffee at the Hope Town Coffee House. LVA grocery store and the A&E liquor store are just around the corner. Evening provides a stunning sunset and the night sky explodes with stars. Whatever your daily agenda, take time to RELAX and relish the slow island pace. Deborah and Rich Flanagan live in the Philadelphia suburbs and were drawn to Elbow Cay for the quiet, unspoiled beauty of the island and Rich's love of bone fishing. 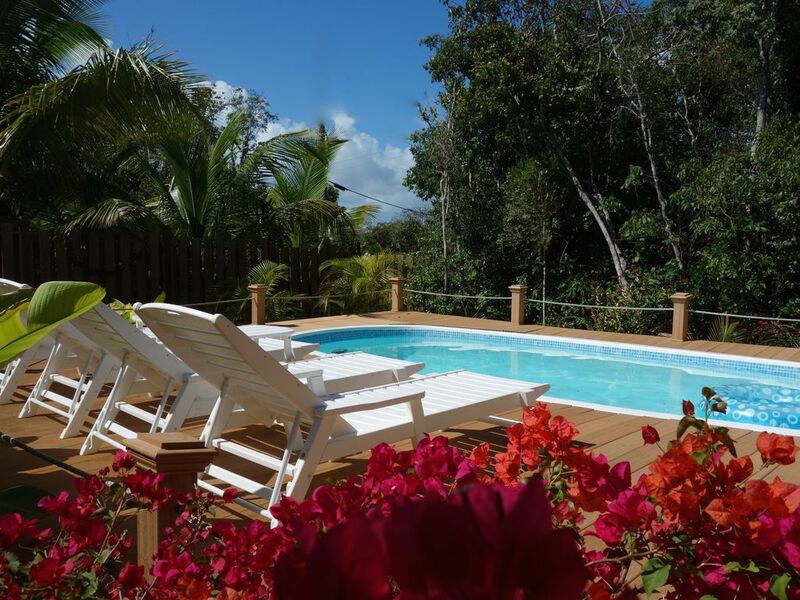 Elbow Cay is a tranquil island and a beautiful vacation destination for true relaxation. Cozy Corner offers all the comforts of home with a full gourmet kitchen and internet and cable service. The pool and deck provide an fun, sun, and relaxation for all ages. The location of Cozy Corner is central on the island and private while not being remote. Just a 7-minute walk to a beach. Two sets of bath towels provided as well as beach towels. Basics: salt and pepper, spices, tea, sweetener. TV in the living room and in each bedroom. Large deck around pool and eating area with retractable awning. Abundance of comfortable outdoor furniture. Flat-screen TVs in all bedrooms, ceiling fans throughout. Retractable awning over portion of deck. Fully equipped kitchen with island and bar stools. Beach towels and mats along with 2 folding beach chairs for use at the beach. New automatic generator installed 2018. We could not have been happier with the Cozy Corner! The house was in great condition, had everything (if not more) that we needed and most of all it was clean! I would come back and stay here in a heartbeat. Everyone went above and beyond to make sure we had a wonderful week. Missing the Cozy Corner and Hope Town! We loved this home, it had all the amenities and the care takers were very responsive to our few requests. We loved the outdoor space and enjoyed the pool. While it does not have a view, the owners have done everything they can to make the surroundings beautiful. Also be aware it is a bit remote. More than enough room for larger groups and excellent storage options for all your friends. Pool is sparkling clean everyday and all appliances are top notch. Loved our stay! We thoroughly enjoyed staying here. The overall design was open, well appointed, tastefully decorated and highly functional. The kitchen and outdoor areas were particularly pleasant. Located in the center of the island, we could easily reach the entire island - town, beaches, ferry, snorkeling, neighborhood exploring, food stores, coffee. Everything was within easy reach, even on bicycles. Such a perfect place and wonderful time! My husband and I enjoyed every day. This home did not lack one thing. The caretakers were we coming and helpful. This is even better than you could imagine. Thank you so very much! Cozy Corner is appropriately named! This was a leisure trip for hubby and I, strictly R&R. Cozy corner delivered! The kitchen is very well equipped, so much so that I advise checking in prior to heading to the grocery. The main living area has an open flow with 2 BRS/1 bath. Upstairs (I would not recommend for children 5 and under due to steep stair access) has 2 beds and a full bath. Thank you Cozy Corner for an over all cozy stay! This quaint island is perfect for relaxing or being as busy as you want to be exploring beaches, boating, snorkeling, fishing or any activity having to do with water.